Well folks, I royally failed on getting this to you on time because it’s two days away from August, but I’m putting it up anyways because I feel like there are a lot of these that are going to be in season for August too, so don’t worry. 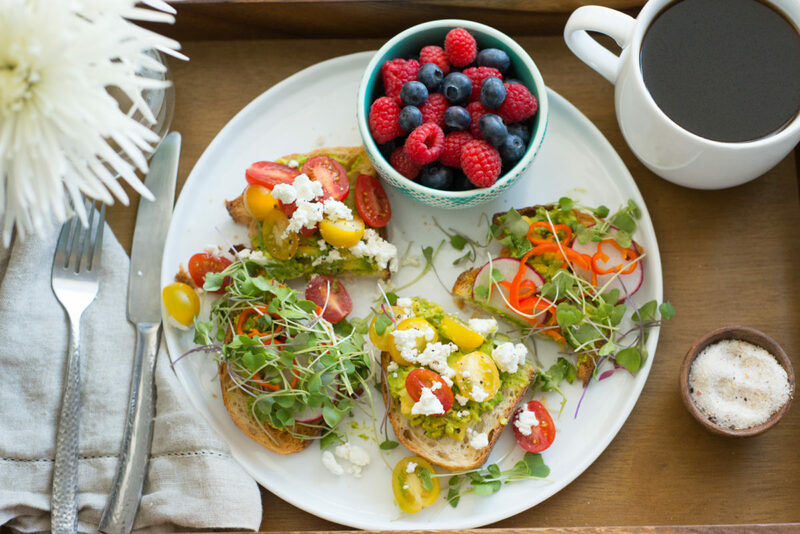 So first of all, everyone eat ALL THE AVOCADO TOAST THIS TIME OF YEAR. 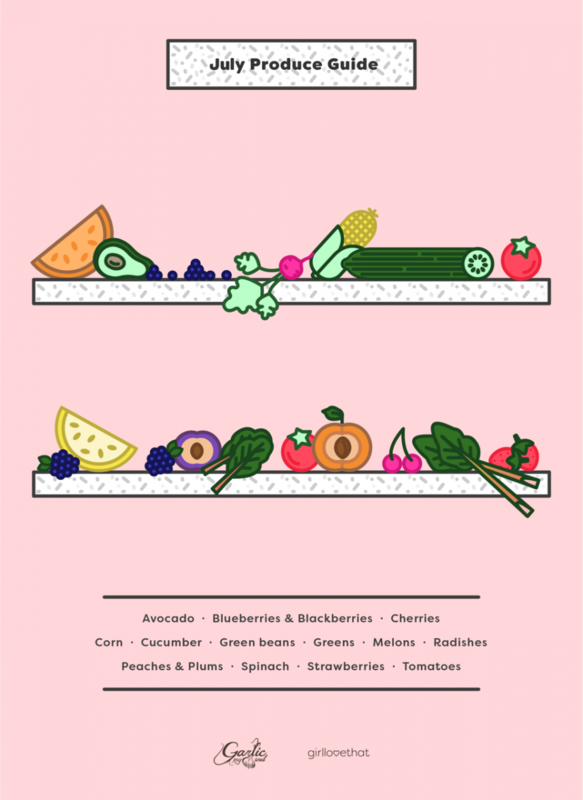 You can eat like 100 things on this list – radishes, tomatoes, and spinach, with avocado on toast. Put some berries on the side. You.are.welcome. I would be remiss if I didn’t include a smoothie. 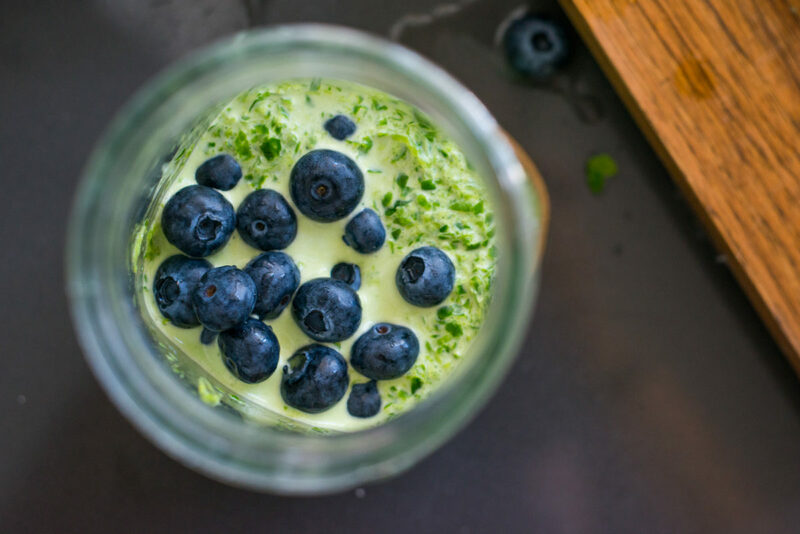 This is a Blueberry Cumber Smoothie. Today I had a smoothie that was kale, almond milk, blueberries, Greek yogurt, and ice. Yum. Either of these are seasonal and fresh and a great breakfast or snack. 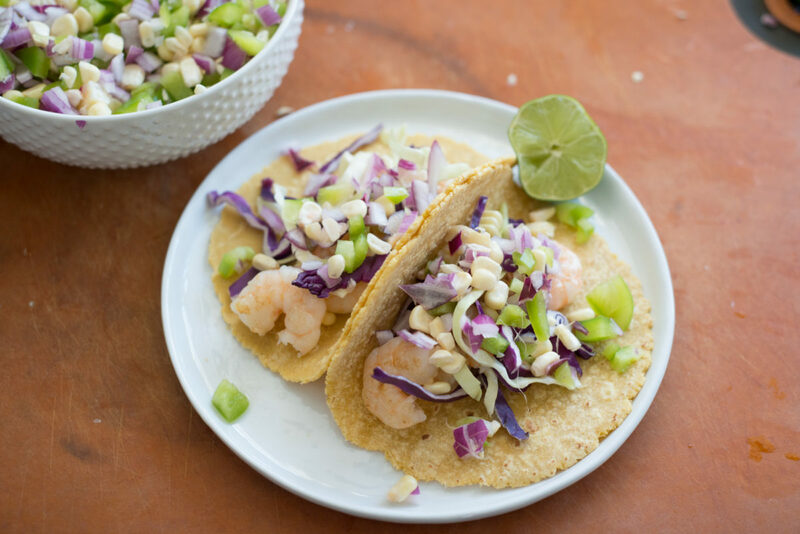 These Shrimp Tacos are topped with all sorts of seasonable veggies – mostly roasted Corn, Peppers, and Onions. These are great for the grilled dinners when it’s too hot to turn the oven on, but you want something hot and great. 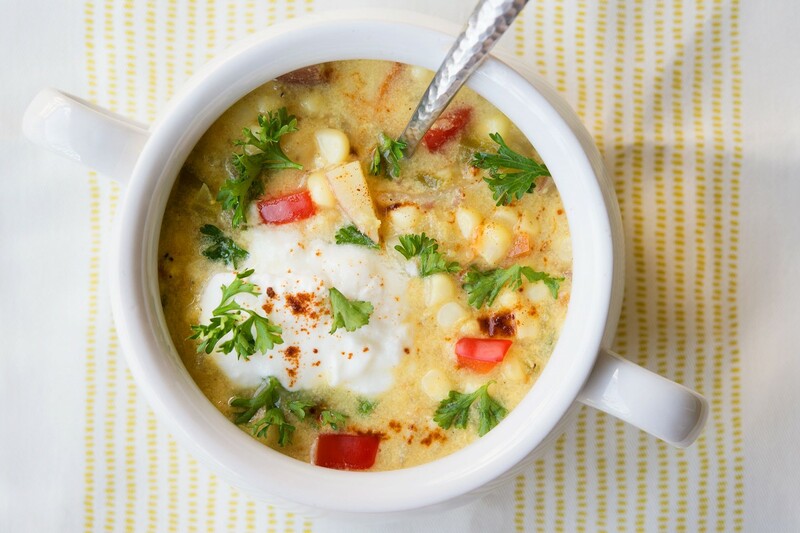 It’s a great way to get tons of veggies in your dinner plus corn, hello? The best this time of year. Stone fruits are bomb and I love them. But I always feel like they are not ripe and then REALLY RIPE and sometimes I end up with too many to eat so I like to put them into a smoothie OR put them into a crisp or crumble. 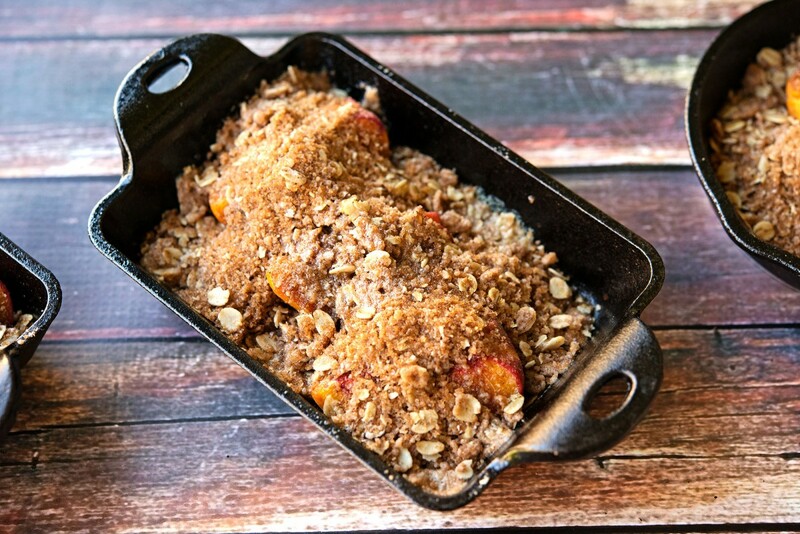 Some kind of awesome dessert with a topping and some whipped cream or vanilla ice cream – enter this Tiny Peach Crisp. 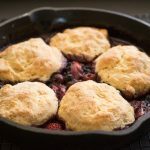 They’re perfect for when you have one or two too-ripe stone fruits but you don’t want to make an entire pan. Plus, let’s be real, crisp is best fresh and hot. With that, we almost head into August, and I promise next month to be more timely! Happy summer produce you guys! Tomatoes. Is there a better flavor? When it comes to summer, tomatoes are THE thing that I think of. But you’ve gotta be patient and wait for the good ones. And oh, where these good. Heirloom tomatoes are like gold this time of year. 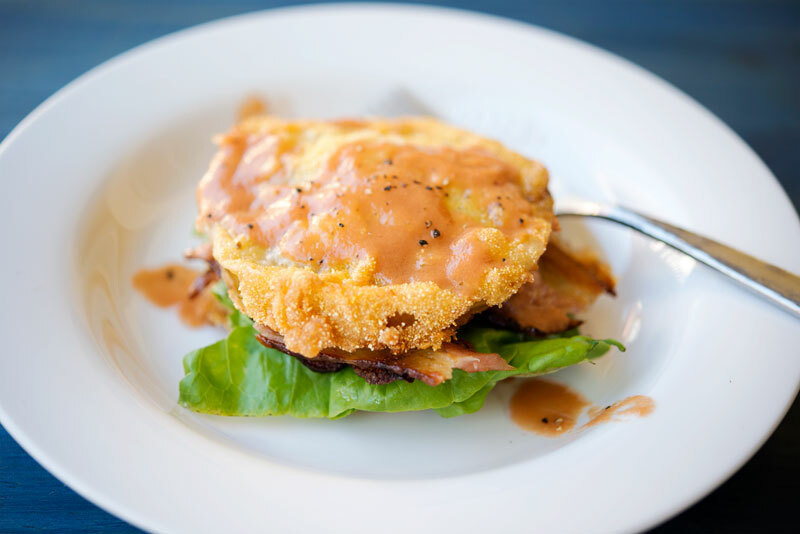 Fried Green Tomatoes have a special place in my heart, but you can’t always find good ones. 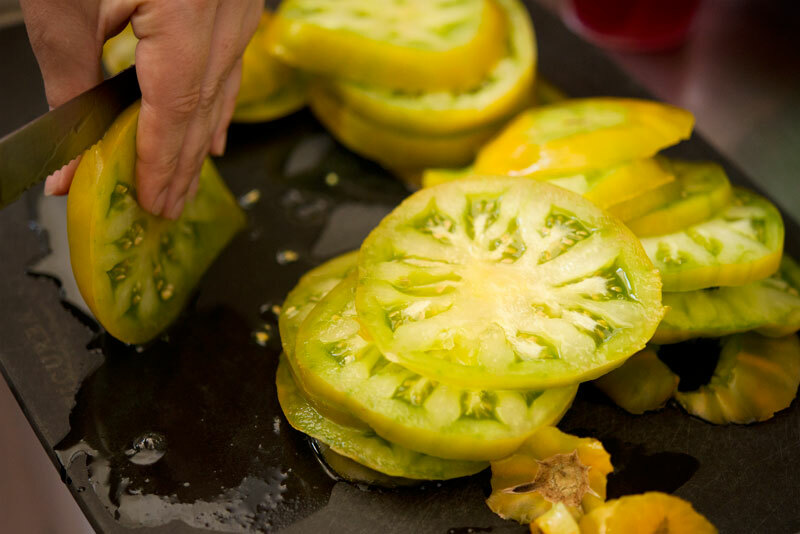 To the farmers market, to find the perfect heirlooms. Big, small, it doesn’t matter – but I love finding juicy ones that are ready.to.fry. We were inspired by a recipe in Sheryl Crow’s cookbook, for these fried green tomato BLT sandwiches. 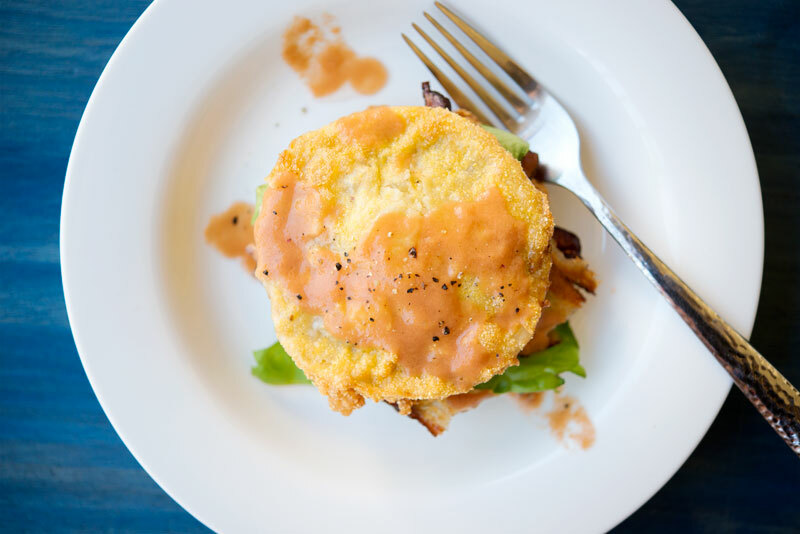 The idea is to use your fried green tomatoes as the bread. Sheryl (and her personal chef, Chuck White) made a slightly fancier version with arugula, pancetta, and a garlic aioli. But we decided to keep it simple with regular old bacon, butter lettuce, and mayo. 1. Slice your tomatoes into 1/4 inch rounds. 2. Pour about 1/2 inch of oil into your cast iron or dutch oven, and heat to about 350 degrees. 3. 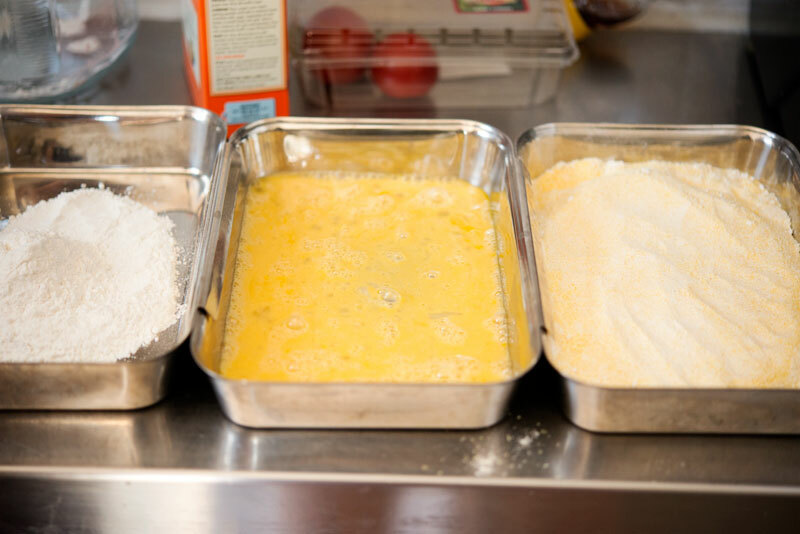 Set out flour, beaten eggs, and a mixture of cornmeal and flour that is about 2:1 cornmeal to flour. 4. Dip the tomatoes in flour, then egg, and finally the cornmeal mixture. 5. Fry the cornmeal-coated tomatoes in oil for about 2 minutes per side, and set on a paper towel lined plate to drain. Lay one fried tomato on a plate, spoon a small amount of mayo on top, followed by a layer of bacon. Add a layer of lettuce or greens, and another layer of bacon, mayo and top with the second tomato. Serve with a tomato emulsion sauce for an extra tomato kick! Yum, Enjoy these all summer long with your tomato bounty! Anyone who knows me knows that I LOVE POPSICLES. I try not to eat them too much because #sugar, so I got stuff to make my own a couple summers back and I am obsessed. Basically an ice pop is a smoothie in frozen form, and a smoothie is just fruit and veggies in liquid form, right? So…these aren’t the worst for you. It’s summer, so ice pops are basically NEEDED to get through when you live in SoCal! 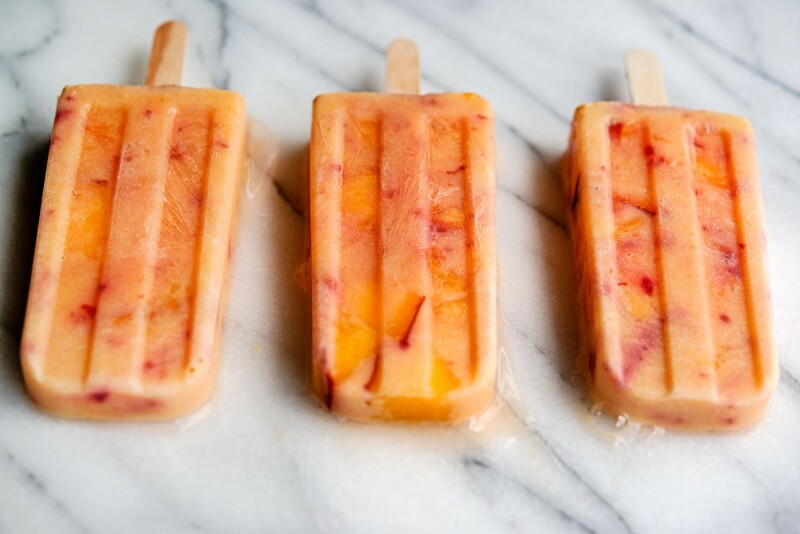 These are Peaches & Cream Popsicles. 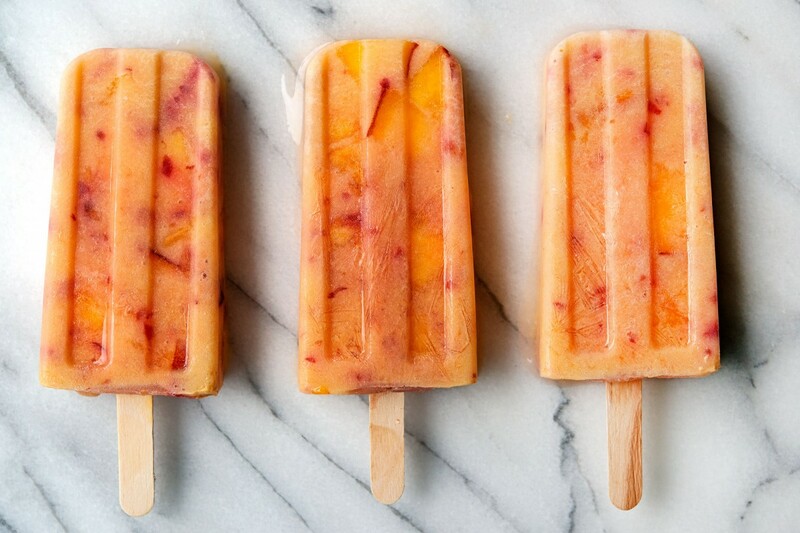 These are made of peaches, yogurt, and coconut milk. 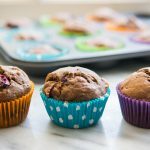 They are simple to put together, and they are the perfect after-work or after-dinner treat. Peaches at this time of year are BALLER and they make me smile wide and think of endless dessert possibilities. I am itching to make peach crisp, but for now, these will have to do. 1. Put your yogurt and milk into the blender, along with a cup of peaches. If you have a crappy blender, like, me, rough chop your peaches first. 3. Dice the rest of your peaches, then put those in and mix well. 4. Pour into popsicle molds, and let freeze until solid, at least 5 hours or overnight. 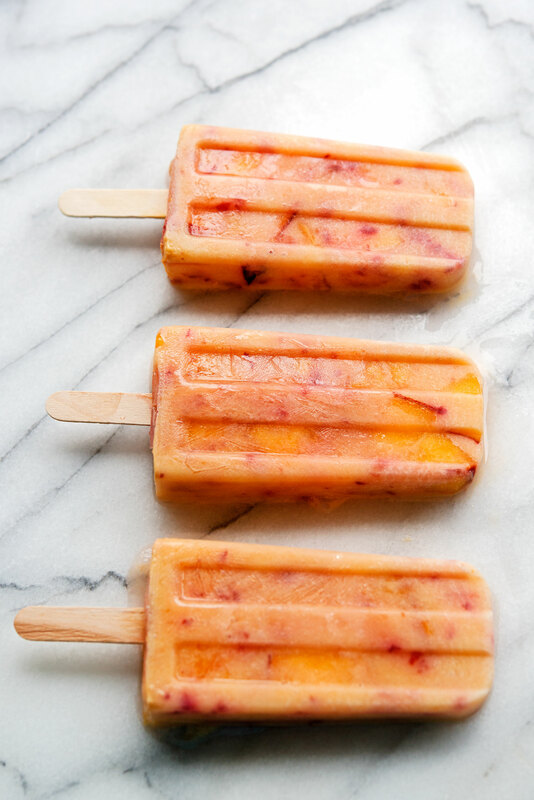 Enjoy these while watching the thermostat climb up and up and up….keep cool, chickadees! 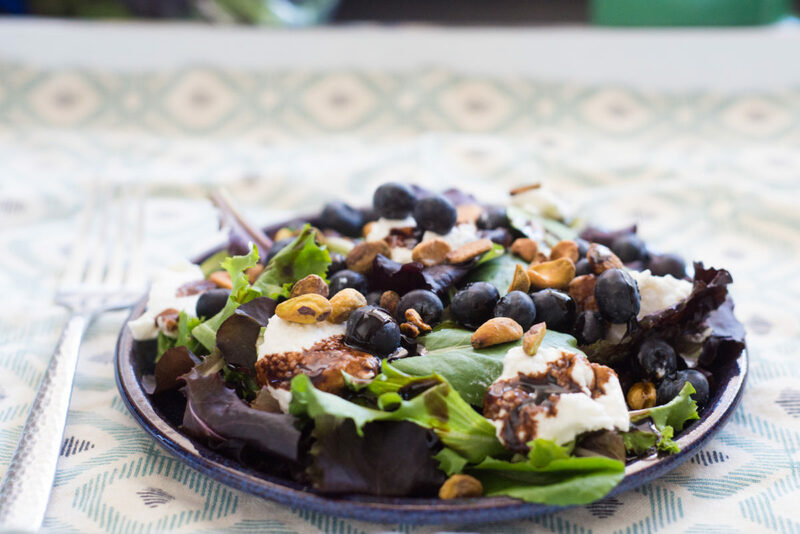 I’m always looking to expand my list of great salads both for main dishes and for sides. I am also trying to expand my list of go-to foods that don’t require meat, or at the very least don’t center on it. And, I think that ricotta is just plain underrated. Whenever we make calzones or my Rosemary Ricotta Dip, inevitably we have some leftover and I hate when it gets wasted. And so, I thought why not make a salad with ricotta at the center? Regardless of the fruit you choose, don’t leave out ricotta – it’s worth it. 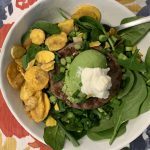 The recipe can be adapted to add chicken or salmon, which is how I ate it last night – with Trader Joe’s breaded chicken that I keep in the freezer at all times. See below, and enjoy! 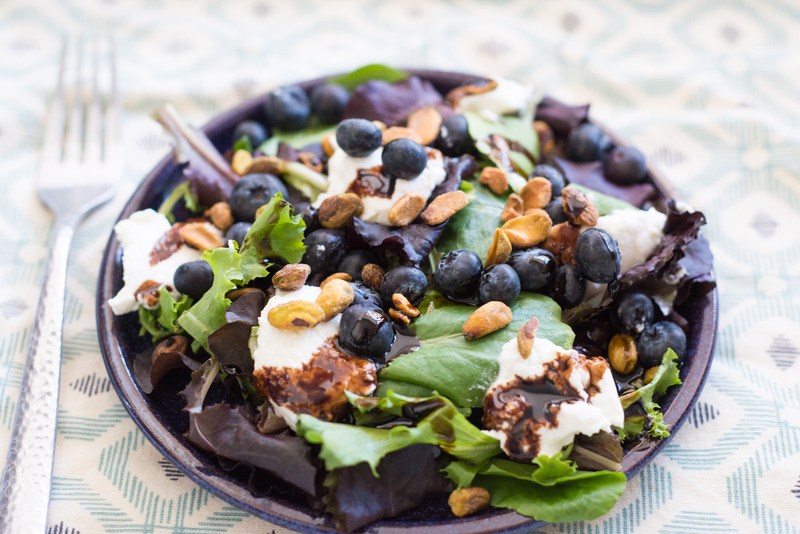 Toss the mixed greens, balsamic vinegar, and olive oil together. 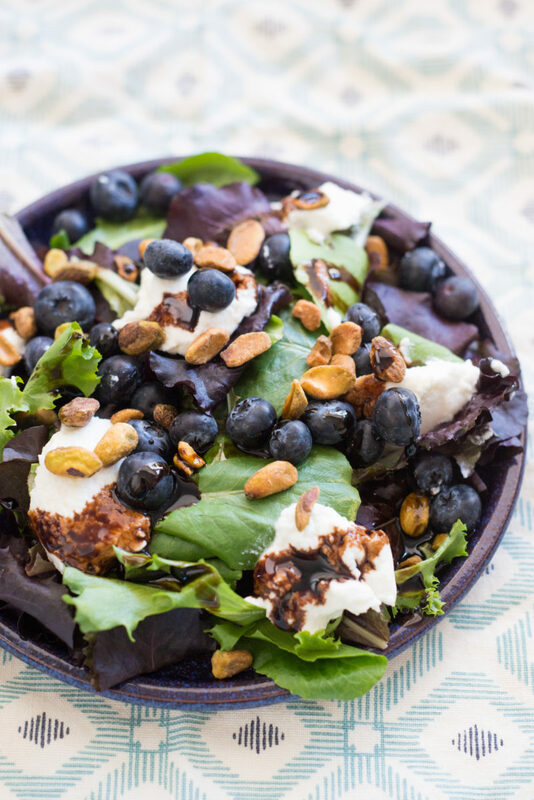 Top with blueberries, pistachios, and ricotta. If desired, add a protein - perhaps some salmon or chicken. 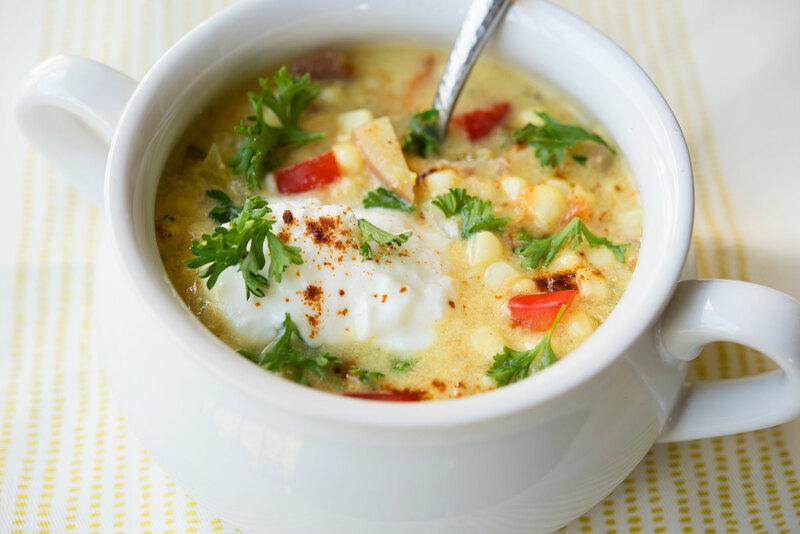 I’m starting to see more and more corn available and it is making me very excited for summertime grilling and perfect dishes full of sweet corn blistered on the grill. 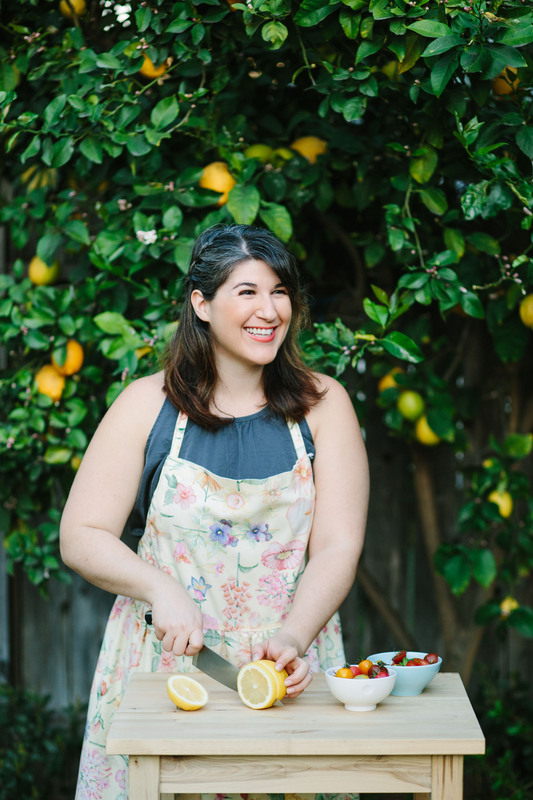 I might have to fill my freezer with some soup before the baby comes – I’m about to enter my third trimester and I think I am going to be slowing down a bit soon as the heat turns up and the belly grows OUT. Anyone else really pregnant in the summer? How did you survive the heat? Chop all things: celery, onion, corn, bell pepper, potatoes. Place olive oil (about one tablespoon) into your pot or Dutch oven, and heat over medium heat. Add onions and allow to sweat for about ten minutes. Add your bell peppers and corn, and cook for another five or so minutes. Do not fret if you feel like this will not be enough liquid; it will be. Take about a third of your soup and place it in your blender; add your yogurt to this mixture, and blend until smooth, and return to the pot. Add your milk to the pot, stirring to combine. Salt and pepper, and allow to simmer until you're ready to serve, but no less than 15 minutes. 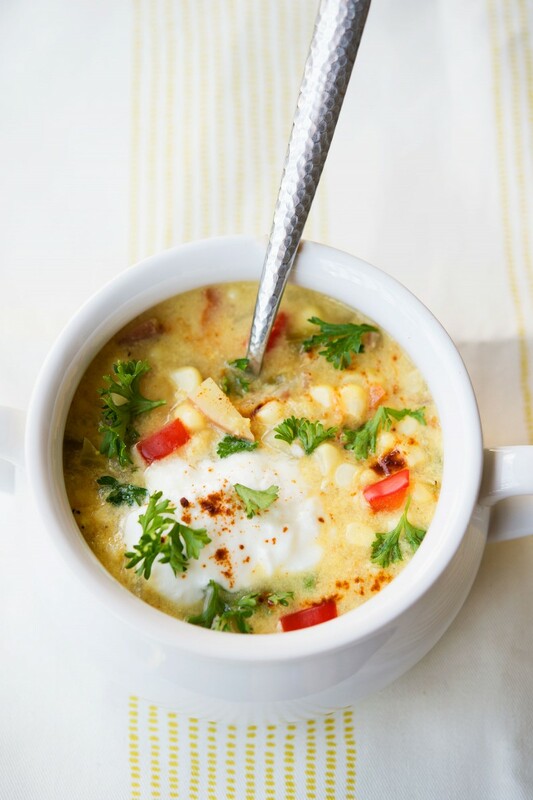 Serve with parsley, bread, and sour cream.